The organisers will make sure you are welcomed in style after your walk between 14.00-17.00 hrs. 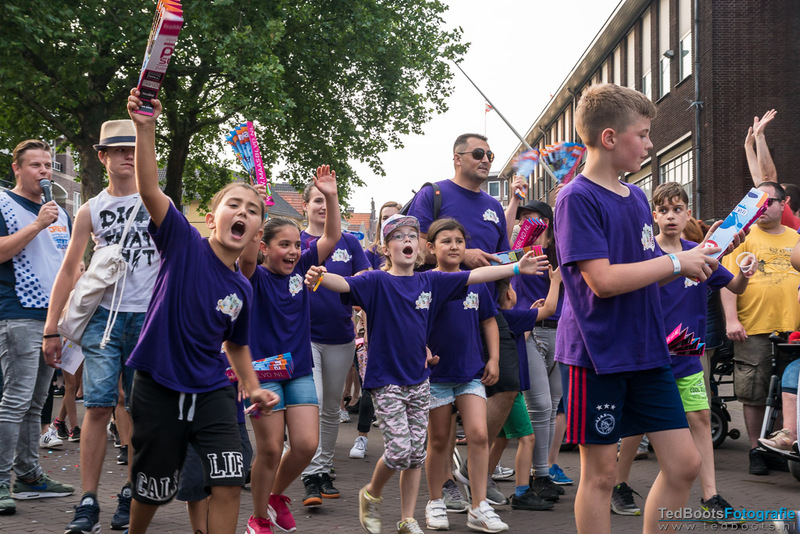 To enjoy this unique experience to the full, plan your finish time in the centre of Venlo to coincide with the festivities. During the Weir Venloop there will be various atmosphere points on Saturday and Sunday Marching bands from Limburg, choirs, drum bands and a host of other vibe-inducing music bands will be performing at these atmosphere points. The locations will be released soon on our website. It takes a lot of energy to finish the Neptunus Walk, so start your day with a delicious, filling Venloop breakfast in the Ewals Cargo Care pavilion in Julianapark before the start of the Neptunus Walk. Together with friends, family and countless other walkers enjoy a freshly fried egg with bacon, crispy croissants, freshly squeezed orange juice and plenty of other flavoursome goodies on offer at this generous breakfast buffet! Buy your entry ticket for the Venloop breakfast buffet on Saturday 30 March for € 7.50 here. Various places where you can take a break and rest, or just soak up the atmosphere, will be provided along the route. You will find various facilities such as toilets and places to sit. You can also purchase tea, coffee or soft drinks and food at various points along the route, but please note you can only pay cash for food and beverages. Your starting place documents include a card and a key cord. During the Neptunus Walk volunteers stationed at various points along the route will punch a hole in the card. Hand over the completed card at the finish to receive a lovely memory of the walk. Sunday 31 March - Half Marathon, 10 km, 5 km, youth runs and G-loop. If the participant is unable to participate in the event, your registration fee minus € 5 administration costs will be reimbursed when deregistering, but only if you inform us by 31 December 2018 at the latest. In accordance with our General Terms & Conditions, no registration fee will be reimbursed for deregistration received after 31 December 2018. There are various places along the route where you can stop and rest during the Neptunus Walk. see: Breaks. Enjoy the Neptunus Walk. It is a unique event supported by large, enthusiastic crowds of spectators. All walkers and wheelchair users taking part in the Neptunus Walk must reach the finish before 17.00 hrs on Saturday 30 March 2019. If you lost something during the event, you can contact local authority Venlo for found objects. If you are looking for hotel accommodation, please visit Van der Valk Hotel Venlo. You can also get your starting place number mailed to your home address. Please state this during registration. The starting place documents will be delivered to everyone´s home address in the two weeks prior to the event. Everyone who crosses the finish line within the time restrictions will be receive a beautifully designed medal. Numerous volunteers will ensure that everything proceeds smoothly during the Neptunus Walk. Traffic marshals will be present at places where walkers have to cross busy roads to ensure the safety of participants. Please observe their instructions. Our mobile cycle team will also be out and about to keep an eye on walkers following the route. Your punch card will be sent to your home address or is ready for you to collect from the Ewals Cargo Care Pavilion. You choice is stated in the confirmation mail you received when you registered. A key cord is also included with the punch card so it is handy to wear during the walk. You can register to take part in the walks up to a few days before the event via the Venloop website. At times that the online module is unavailable, you can purchase a walker starting place at the Venloop office on Koninginnesingel 14, Venlo. This is only possible on weekdays and please note you can only pay cash. The registration office is located in the Ewals Cargo Care pavilion at Julianapark (on Deken van Oppensingel) close to the start and finish. If you have not received your punch card at your home address please collect it from here. Walkers can collect on Friday 29 March between 12.00 – 17.00 hour. The route taken by the Neptunus Walk passes through some areas of outstanding natural beauty in our municipality. At a future date, you can download the route and view it on our website. Signage will be placed along the route on 30 March. Please do not leave any litter behind. Keep Venlo clean and tidy! During the Neptunus Walk all the participants are not only walkers, but they are also road users. Please take other road users into account and keep to the footpaths where possible. Sanitary facilities will be provided at the Ewals Cargo Care Pavilion and at all places where you can take a break. A toilet for the disabled is also provided at the Ewals Cargo Care Pavilion. See Breaks for further information. Signs will clearly indicate the route to be followed during the Neptunus Walk. You can transfer your starting place for the walk to another person. As the starting place is not individually assigned you do not need to complete the transfer form. If you come from further away and want to make your participation a weekend stay, why not find some inspiration here. Although we have organised so many activities that the five day programme will just fly by! The Venloop Walk & wheels route is 7.5. kilometres and starts at 13:00 hrs at BMW de Vilgaard in Velden. This means that people taking part in the Venloop Walk 7 Wheels event will cross the finish at the same time as the other participants. Wheelchair users can take along someone to accompany them during the event. In the event of extreme weather conditions the organisation maintains the right to cancel the event. Furthermore, we ask all participants to monitor the weather on the race day and to adapt their clothing, food and drinks accordingly. The organisation will always do its upmost to adapt the event to the weather conditions. You can purchase various Venloop merchandise such as T-shirts and flags from our webshop. You can get the products posted to your home address or collect them at our office. Payment can be made via iDEAL or in cash at the Weir Venloop office.